Nicolas Lancret began his apprenticeship in the field of printmaking, shortly afterwards moving to the studio of the minor history painter Pierre Dulin. In 1708 he is registered as a student at the Académie Royale de Peinture et Sculpture in Paris. It is not known, however, at what date he entered the studio of Claude Gillot, who was also Watteau’s master. During this period of his career Lancret abandoned history painting to focus on scenes of fêtes galantes. 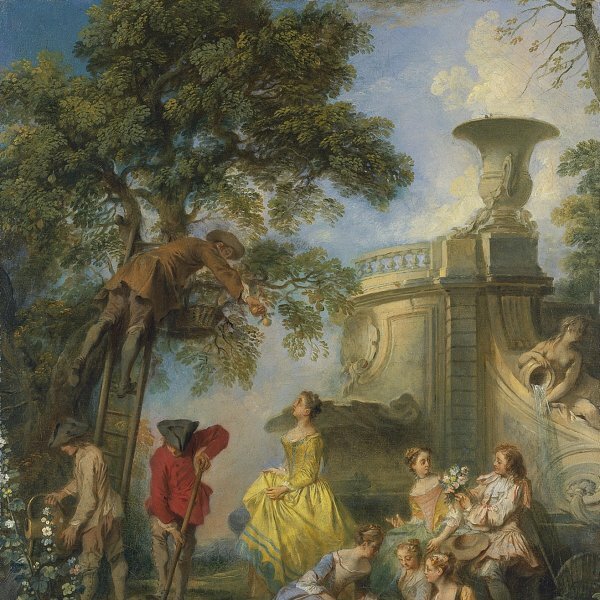 While he never studied with him directly, he based himself closely on Watteau, particularly at the outset of his career. 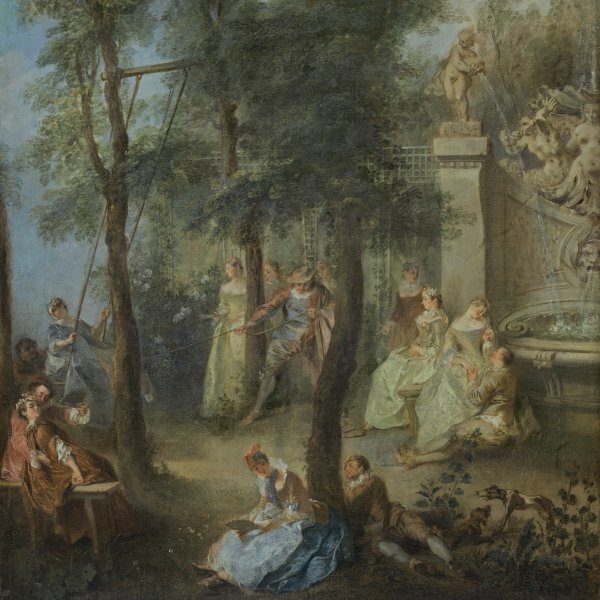 In 1719 Lancret was admitted to the Académie Royale in the category of painter of scenes of galanterie created some years earlier for Watteau. Lancret’s style gradually became more individual, particularly with regard to his use of colour and his tones became livelier, based on a combination of chalky yellows and bright crimsons that became a distinctive sign of his work. He also explored new themes such as allegorical cycles or portraits in the guise of genre scenes. His work was an important reference point for painters such as François Boucher, William Hogarth and Thomas Gainsborough. In the 1720s and following the death of Gillot and Watteau, Lancret became the leading genre painter in France. He was a prolific painter and is considered to have produced around 700 works. His most important patron was Louis XV who commissioned a large number of works from the artist for royal residences throughout Lancret’s career. Another admirer of his work was Frederick the Great who owned at least 26 of his paintings. Lancret’s compositions were widely known through reproductive prints, which were in themselves extremely successful commercially. Lancret was also a collector and assembled an interesting group of drawings and paintings by Old Masters and contemporary artists.